At Law Offices of George Boisseau, my mission is to learn and understand my clients' needs and the external factors affecting them so that I can aggressively and professionally represent them throughout the legal process. I clearly communicate my legal knowledge and experience, thereby enabling my clients to make well-informed decisions for themselves. 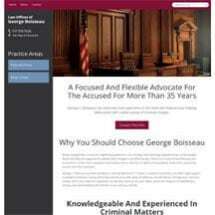 MoreAt Law Offices of George Boisseau, my mission is to learn and understand my clients' needs and the external factors affecting them so that I can aggressively and professionally represent them throughout the legal process. I clearly communicate my legal knowledge and experience, thereby enabling my clients to make well-informed decisions for themselves.